Asphalt Drum Mixers' recycle systems allow plants to use milled material in hot mix asphalt, reducing paving costs. The 15-ton-capacity recycle bins stand strong with continuously welded seams. ADM reinforces the bins with angle irons and midsection stiffeners and incorporates steeply sloped sidewalls to prevent material from plugging or bridging. A tapered discharge opening leads to the direct-drive belt feeder, which includes a 5-hp motor, multi-ply belt, self-cleaning tail pulley and adjustable skirt boards. The recycle system transfers RAP from the bin with a heavy-duty weigh conveyor that features a channel frame and wind shroud protection for accurate weighing. The conveyor is 2 feet wide and, depending on the model, between 45 and 65 feet long. It introduces RAP to the dried aggregate mix after the heating process. As much as 50 percent of the HMA can contain recycled pavement, depending on the conditions and type of plant. Portable units feature a heavy-duty I-beam frame on a gooseneck trailer with a fifth-wheel kingpin hitch, single axle and air brakes. 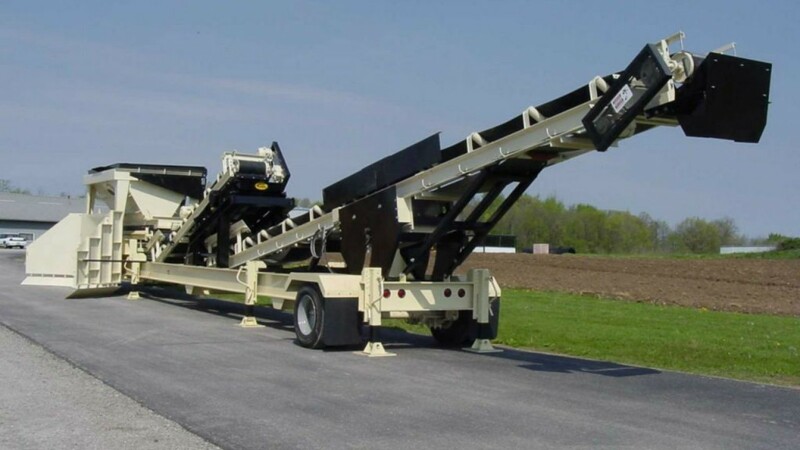 The trailer includes hinged support legs and a hydraulically controlled incline conveyor. An optional lump breaker breaks down large pieces of RAP into useable sizes. It features an adjustable steel breaker plate and replaceable tungsten-tipped teeth, and is powered by a 30-hp, high-efficiency motor with an open-mesh-covered V-belt drive. Single- and double-deck scalping screens are also available to ensure oversized material does not enter the aggregate mix. Other options include air cannons, grizzlies, bin extensions, adjustable legs with sand shoes, and a skid with bolt-on support legs.